Great alternative to Intel's stock cooler especially when space is at a premium. Gelid's POLAR CPU cooler is designed for HTPC, Panel PC, Car PC, 1U Server and Thin ITX systems. The height of the heatsink is just 27 mm meaning it will fit most slim low profile cases. The POLAR also has an improved heatsink fin configuration to achieve high cooling performance in a compact design. The cooler weighs only 127g and especially conforms to lightweight Panel PC and Car PC applications. 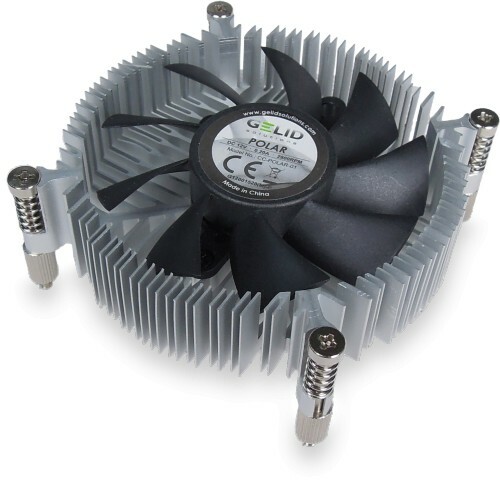 A quiet 75mm frameless fan with the intelligent GELID PWM (Pulse Width Module) control was chosen to be integrated into the heat sink. The fan blades are optimised to a minimum fan speed of 1400 rpm while still being able to guarantee high airflow. The intelligent GELID PWM control keeps the fan quiet but accelerates the fan speed whenever additional cooling is required. The multi-award winning high performance GC-2 thermal compound is already pre-applied on the heatsink. The POLAR is compatible to Intel Celeron, Pentium Dual-Core, Core i3 and Core i5 CPU with a maximum TDP of 65W. The cooler fits multiple Intel CPU sockets such as LGA 1150, 1151, 1155 and 1156. Decent CPU fan but not an upgrade over the standard Intel unit. A lot slimmer and easier to clean though if that's what you're after.